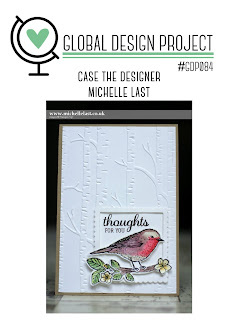 The current challenge at Global Design Project is to case a card by designer, Michelle Last. This is a heavenly project because the card contains so many of the elements I love in a card: lots of clean white space, some texture, a coloured border and a focal point in the lower right corner. Glorious! I love the card we've been given to CASE and love even more Michelle's CASE of her own card! Additional features I've taken from the card are the scallop border on the focal point, the use of die cuts and the sentiment being contained within the borders of the shape. I'm still having a love affair with the new Eastern Palace suite, available next week to customers, so I turned to it again for this card. It seemed to be begging me to dig out of retirement the Beautifully Baroque embossing folder - one of my first Stampin' Up embossing purchases. I do love the way the medallion dies in this suite fit so well with both the layering circles framelits and the stitched framelits so that it's easy to build depth in a design. The little touch of copper adds opulence to the card. I ombred the sentiment with Sweet Sugarplum and Fresh Fig, a lovely tip I picked up from the Artisan blog hop featuring Eastern Palace a couple of weeks ago. Other: Eastern Medallions framelits, Layering circle framelits, Stitched Shaped framelits, Beautiful Baroque embossing folder (retired), Sweet Sugarplum candy dot, dimensionals. Oh, wow! 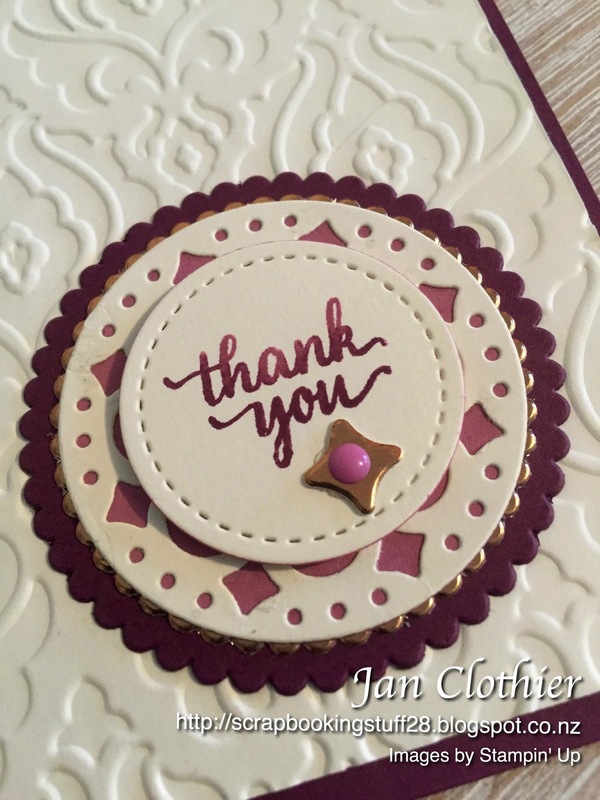 A beautiful old and new project, Jan. A lovely take on Michelle's card using the Eastern Palace Suite and your colours and details are perfect. Thankyou for sharing your project with the Global Design Project Challenge this week. We would love for you to Pin your project to the Global Design Project Pinterest board. Your card is so elegant Jan,thank you so much for casing me this week at the Global Design Project!